For instance, it wouldn't be possible if the Pawn was on the verge of queening. But is it always possible if the Pawn started off on its original square? Is it usually possible? Or is it only rarely possible? How is it accomplished? So long as a white knight has the black pawn securely blockaded on one of these squares (or further back), then white can win no matter the other arrangement of the pieces. 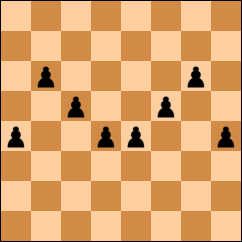 Now there are also times when white can still win with the pawn already advanced beyond the Troitzky line, but then it usually depends on the location of the black king; that is, the board usually breaks down into a drawing region for the black king, and a losing region for the black king. Establishing that was also part of Troitzky's work. I'd be way out of my depth trying to say anything about the details of Troitzky's analysis, and besides, he spent a good 60 pages or so working out the things that he did. But it's not too hard to get the conceptual idea behind the Troitzky line. The most basic winning approach for white is this: to blockade the pawn with one knight, then use the king and other knight to corner the black king, and finally release the pawn to move while bringing the blockading knight in to deliver checkmate. In order for this to work, white needs a fortuitous combination of (1) the pawn not being too quick to queen, and (2) the white knight not being too slow to deliver checkmate. Since the knight is most mobile - has the most travel options - in the center of the board ("A knight on the rim is dim" and all that), it stands to reason that the further away from the center the knight starts, the more time it will need for a win to be guaranteed in general, and so the further back the pawn needs to be from queening. This reality is reflected pretty clearly in the inner V shape of the Troitzky line. But what about those far advanced rook pawns in the Troitzky line? Well, as often happens with rook pawns, they lead to special cases. Here, the reason white has this additional leeway is because of Stamma's mate, as is pointed out, for instance, in section 35.03 of this article on ChessCafe by Karsten Müller (of Fundamental Chess Endings fame). So if a white knight securely blockades the black pawn on one of these squares (or further back), then white can always win in under 50 moves. Note that while there's no guarantee of a 50-move win with either a b- or g-pawn, Conrady's analysis also showed that if the pawn is blockaded on b6/g6 or further back (as in the first Troitzky line), then for over 99% of the possible positions there is a win in under 50 moves. Not exactly an answer, but comments on the question and following post. (a) It is possible in certain cases with the pawn on the verge of queening. 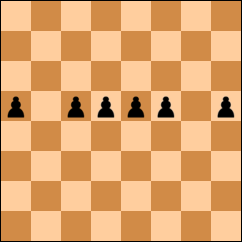 See the positions shown in the section "Role of the pawn in two knights v pawn ending" here (there are others). (b) There are exceptions to the Troitzky line rule as stated. See "Proposed changes to the Troitzky line article" here The positions shown also answer in the negative your question regarding pawns on their starting squares. (c) The second Troitzky line rule tells you nothing about the win within the 50 move rule if some moves are needed to effect the blockade. E.g. the pawn can be securely blockaded on c5 in the position below, but I don't think white can win under the 50 move rule (I don't have a DTM50 database to check that). (d) Further to (c), it is stated that Helmut Conrady solved the problem using the Nalimov databases. I'm not saying he didn't, but this would have been extremely difficult using the Nalimov databases at the time because the databases took no account of the 50 move rule and the play they suggest can be incorrect for either side if the 50 move rule is taken into account. (e) All of the exceptions to the Troitzky line noted in (b) are, of course, also exceptions to the "second Troitzky line" rule. Though one is shown on the knight's file it can be relocated two files to the Queen's side and remain an exception. Not the answer you're looking for? Browse other questions tagged endgame pawns draw knights checkmate or ask your own question. Can a grandmaster always draw?